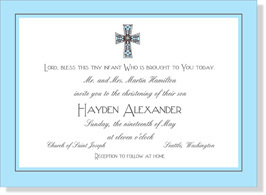 Soft blue border with thin brown pinstripe frames this simple card with an elegant cross. Ideal for boy's baptism, christening or first communion. NOTE: Only 5 sets left! SIZE DIMENSIONS: 5" x 6.875"